Plus Size Faux Fur Coats are the way to go with you want glamour and style. I love beautiful faux furs coats and think they look absolutely stunning on plus size ladies. Gorgeous faux fur is a classic and never really goes out of style, but they also happen to be very popular right now. When shopping for your perfect faux fur, the first decision is the color and print. Do you want your coat to have a classic and traditional look, like a gorgeous mink, or do you want something trendier - like a leopard print? In between there are ample choices including: Fox, Raccoon, Lynx and Lamb. The next decision is the style - do you want a long coat or a short coat or jacket? This will undoubtedly be determined by where you will be wearing it? What is the most important consideration- style or function - or both? Faux fur coats are an affordable, easy to care for alternative that, of course, is much friendlier to our animal friends! The fabric is much more durable than the real thing - it doesn't require any special care and doesn't attract moths and other insects. A good quality coat will last for many years. 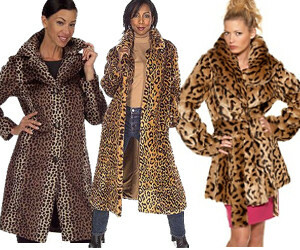 Leave Plus Size Faux Fur Coats, Go to Trendy Plus Size Clothes Home.